As anticipated, T-Mobile has just sent out a press release announcing the official kick-off of their Smartphone Upgrade season with a $0 down sale on the hottest new handsets. The sale is exactly what we learned last night thanks to the leaked emails that hit my inbox and while I wouldn’t exactly call this a “sale,” T-Mobile would beg to differ. Ultimately, the benefit here is the lack of any upfront payment and the hope that you don’t suffer bill shock when you recognize an extra $29.50 is tacked onto your monthly statement as happens with the Galaxy Note 3. The sale itself offers $0 down on the Galaxy Note 3, Galaxy S 4, LG G2, and Galaxy Note II. Unlike the email yesterday evening, the company’s official press release makes no mention of the iPhone 5c leading us to believe that only the four devices mentioned are included in this special offer. For those of you who have been eagerly anticipating the Galaxy Note 3, does the $29.50 monthly installment price alter your buying decision at all? Will you hold off until the down payment increases so you can decrease your monthly cost? BELLEVUE, Wash. — Oct. 2, 2013 — The weather may be cooling down but the deals are hot at T-Mobile (NYSE: TMUS). Beginning today, October 2, T-Mobile is offering the ultimate promotion of zero dollars down on some of the newest, most popular devices, including Samsung’s next big thing – the Samsung Galaxy Note® 3 – and LG’s flagship smartphone – the LG G2 – plus the Samsung Galaxy S® 4. With this limited-time promotion, new and existing well-qualified consumers and small business customers will get affordable and hassle-free access to the latest 4G LTE smartphones at the upfront price of $0 down with monthly device payments1. In addition to the promotion, customers can also take advantage of T-Mobile’s groundbreaking upgrade program, JUMP!™, which offers the freedom to upgrade to a new device more frequently and affordably, and includes handset protection that helps to protect against malfunction, damage, loss or theft – all for just $10 per month, per phone (plus taxes and fees). The Simple Choice Plan from T-Mobile starts with a base rate of $50 per month for unlimited talk, text and Web with up to 500MB of high-speed data on its advanced nationwide network. Customers can get up to 2.5GB of high-speed data for $10 more per month per line or unlimited 4G data with up to 2.5GB of tethering for an additional $20 per month per line. Customers can add a second phone line for $30 per month and each additional line is just $10 per month. No caps, no overages on T-Mobile’s network and no restrictive annual service contracts. T-Mobile’s blazing-fast 4G LTE coverage now reaches 180 million people in 154 metro areas across the United States. The company is quickly building toward nationwide 4G LTE coverage, in addition to its nationwide 4G HSPA+ network, which reaches 228 million people. Customers can enjoy a consistently outstanding 4G wireless experience, seamlessly connecting to both T-Mobile’s nationwide 4G HSPA+ and rapidly expanding 4G LTE network. Why no Iphone 5s with 0 down sale ? Because the iPhone 5S is selling perfectly well without any extra incentives. You mean the iPhone 5S is selling perfectly well without extra incentives. The iPhone 4S is 2 years old, $0 down for well qualified customers, and not in demand as much as it once was. The poster had posted “Because the iPhone 4S is selling perfectly well without any extra incentives.” However, that poster edited to 5S after my comment was posted. No meaningful stock levels… Employees can’t even buy yet. I have one and i LOVE it. My store got 40 in. Because the promotion is for smartphones only. The iPhone is a smartphone. The promotion is for select Smartphones which doesn’t include the iPhone 5S. Sarcasm isn’t lost on me. If that poster was being sarcastic or trying to be funny it didn’t come across that way. lol it did to everyone else, so yes sarcasm was lost on you this time around. I thought the 5c was already $0 down anyways, save the higher capacity ones. I actually wouldn’t mind if T-Mobile keeps their phones at zero down permanently. I don’t mind paying the extra five bucks or so on the monthly payments and perhaps if they wanted to do an actual “sale” they could (and I know everyone hates this) do something in the form of a mail-in rebate. Alas, it’s a marketing ploy, so I don’t expect as much. The 16gb IPHONE 5C is $0 down for well QUALIFIED customers. If you go to the T Mobile site a click buy now for IPHONE 5C you will see the 16gb one is $0 down. I bought the 5S with Touch ID on Sept 20th, but I just checked the T Mobile website to see if the 5C was $0 down and the 16gb one was. Wait! “The iPhone 5S with Touch ID”. so because I say the IPHONE 5S has touch ID I need to get a life? You need to get a life and GROW UP. Do they offer one without Touch ID? I was just confirming what I initially thought. I wasn’t sure. Well if you weren’t try to be rude or sarcastic than my bad for jumping on you. Your’e a complete moron. Everybody knows it has a frakking touch ID. Maybe you should say my “Recycled 5 now 5S with the same non HD display with Touch ID”. F*cking people who use iPhones have SUCH HUA disease. Michael, in regards to the moron comment. IT TAKES ONE TO KNOW ONE. Everyone doesn’t know the iPhone 5S has touch ID. Just like everyone doesn’t know all the features on an Samsung S4. There are features on the Samsung Galaxy S4 that I probably don’t know about. Why because I don’t really research what that phone has to offer. You need Jesus in your life. I am surprised you’re in sales with that attitude. What do you care how I said what I said? Some poster in this comment section said “Because the iPhone 4S is selling perfectly well without any extra incentives.” I corrected them saying you mean the 5S without calling them names. You should learn respect, manners, and tact. Do unto others as you want done unto you. BTW: I am a Certified Public Accountant and not a Salesman. If you have a problem with the $0 and the higher monthly payment. Just pay extra up front to lower the monthly payment. You don’t have to do $0 down. If your in the jump program , 0 down is better because you will have less money invested up front so when you trade it in for a new phone in 6 months you come out ahead. So you’d be able to adjust your monthly payment based on how much you decided to pay up front then, correct? You could pay off half of it if you wanted and have the 24 months of payments reflect that? Exactly! Don’t they usually have a sale at the beginning of the year anyways? If not that, then usually Valentine’s Day for sure. I think I’ll stick with my Lumia 925 for now. Damn, the G2 went up $20 for those of us who aren’t “well qualified”. I wonder how they will price the Nexus 5 when they get it. Anyone ever seen Pretty Woman when she walks into a snobby store? We’ll that happened to me today in my local tmobile store. I got off work. Raced over to see the note 3 on display. I’m one of those customers that sales people want. Instead it turns out, they didn’t know the specs for the phone – I had to show on their demo that Samsung didn’t release a 16gb this is a 32gb and first told me a flat No, we will not sale it to you for retail. Little do they no, I happened to work in sales for phones for all carriers. And happen to love Tmo! So I asked why can I not buy the phone straight out. This is where a sales person should never assume, especially when they already had shown no knowledge of the device -he said because you use family Mobile as if the way I looked compared to his shirt and tie -that I must be cheap. Are you sure it was a corporate store? Probably some stupid 3rd party retailer. They are very hard to tell the difference when in the store. Shirt and tie? Definitely not a corporate store. Once again. I don’t have a family mobile plan. And never told the sales rep that. I hope next Thursday my nightmare will end when I buy the phone out right. I love my 5gig prepaid plan with unlimited text. But if I keep running into craziness in trying to buy a phone or accessory for my awesome tmobie phones, I will just move back to verizon. the sale is 0 down.. but you have the option to put down however much you want, to modify your monthly payment price..
Is this for existing customers also? Yes it’s for “WELL QUALIFIED” new or existing customers. If I choose to put more down at purchase, say $150 to $250, is it standard practice to shorten the number of payments or is there an option to lessen the amount of each monthly payment for the phone? Always a catch..I bought the s4 Friday and now I askee to return it to get the 99.00 down money back..they told me there is a 99.00 restocking fee..lol..wtf..its all smoke and mirrors. .your still paying full price for these phones no matter how you look at it..sick of the deceptive advertising these companies do..
You are an idiot. The phone is still the same price. Every return that is done obviously has to match the paper work. Some stores just cant waive their restocking fees (Some managers will be more flexible depending on their remaining credit budget, or if you are a tenured customer they may). There is no deceptive advertising….YOU WILL ALWAYS PAY FULL PRICE FOR A PHONE BUT PAY A CHEAPER MONTHLY BILL….if that doesnt work for you, you dont have to be with T-Mobile. lol I thought the same…no matter if you’re on contract or off you’ll still pay the full price of the phone, at least with tmobile you’ll be paying less on your bill, with no contract..try doing that with the other three carriers. Lol, it isn’t a sale. It is just a lower upfront cost. And as far a the restocking fee, they tell you that clearly, 14 days buyer’s remorse… with a restocking fee. Micheal you are correct. I would much rather receive a discount than zero down. No matter how it sounds 600 is 600 hundred no matter how many ways you slice it. Could you give money down towards the device even thought its $0 down? i.e., making the monthly payments less. 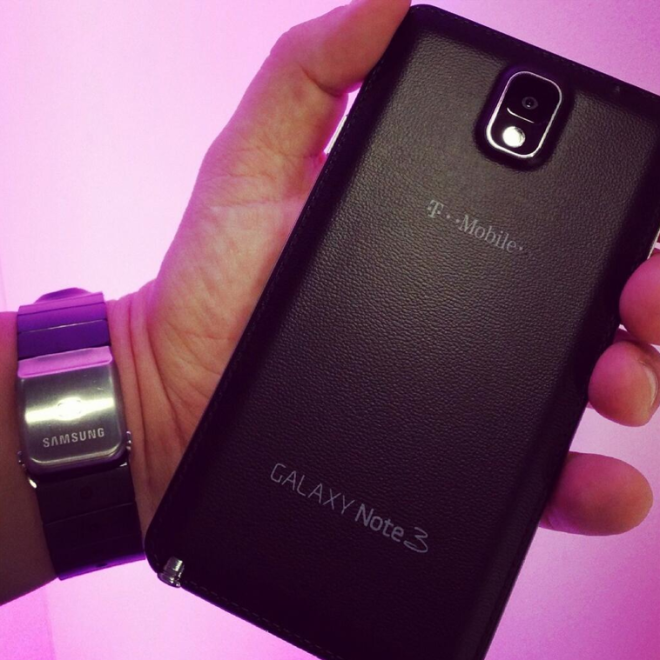 the note 3 is better…. -samsung replaced google now with s search (HUGE NEGATIVE) thats what long press gets you now. hope this gets changed back. -notification light is smaller….why would they do this? these are only some of the things i noticed only having the phone for 24 hrs but its not all bad. -keyboard is very snappy and responsive with lag happening only rarely. bigger battery and bigger 1080p screen would be the only change i see. away 50 bucks to the tmo store. I just got my note 3 today and I absolutely love this phone. Is a phone that cost $700 off sale and then cost $700 when its on sale really on sale? I’m just asking. I dont want to go to Sprint, but I really dont want to spend 700 on my next phone. So helllllloooooo Sprint.